*Please see important details below regarding shipping chocolate products to warm areas! Remember those awesome coconut and chocolate candy bars from your pre-vegan days? Well, Mama Ganache takes that fantastic combination and has created these delicious Organic Coconut Chocolate Patties, giving you even better flavor than you remember paired with good-for-you organic ingredients and nothing artificial! The perfect little treat, each patty is packed full or rich and creamy organic coconut for the perfect indulgence any time the mood strikes. 0.5 oz. 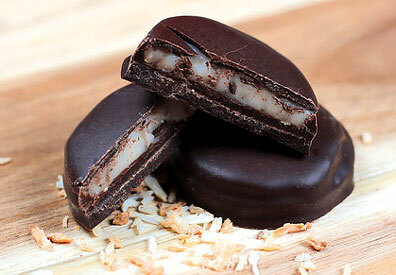 (15g) Coconut Patties are $1.99 each. *NOTE* - Chocolate can melt in the summer heat, especially if your destination area temperature is in the mid 80s or above when the package takes more than a day or two in transit. We recommend expedited 2nd Day Air shipping and/or the addition of a cold shipper (offered below) for orders where you want to minimize the risk of melted chocolate, and that it is delivered where someone will be there to accept the package at time of delivery (work address if not at home). The link to select a cold shipper is shown below, please click that link to be able to add the appropriate cold shipping supplies if you wish to protect your items during the hotter months. We cannot accept responsibility for melted chocolates, so please order at your own risk!